Monarch Air Group provides private air charter in Rifle, CO. Our clients benefit from top-notch service, unrelenting dedication to safety, wide selection of aircraft, and years of experience in chartering private jets. To obtain a free quote, please use our online quoting tool provided below, or call toll free 1-877-281-3051. Situated in Garfield County of Western Colorado, Rifle is a town that situated about 88 miles west of Vail, 68miles northwest of Aspen, 149 miles west of Denver, and 137 miles west of Boulder. In 1882 it was established by Abram Maxfield and in 1905 was officially incorporated. Riffle is a regional hub of the cattle-breeding industry. Being small mountain town, it has rich history, western heritage, natural beauty, amicable atmosphere and tranquil environment. 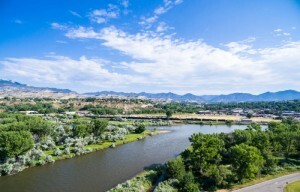 There are a few recreational areas, which situated within Rifle – the Rifle Mountain Park, the Rifle Gap State Park, the Flat Tops Wilderness Area and the Harvey Gap State Park. Most tourists like camping at Rifle Falls State Park, fishing on the Colorado River, and hiking at Rocky Mountain National Park. Surrounded by the green mesas and the Bookcliffs Mountains, Rifle is famous top popular destination and a perfect site for western outdoor retreat. Rifle has easy access to nearby cities and towns such as Collbran, Battlement Mesa, New Castle, Silt, Parachute, Grand Junction, and Glenwood Spring. The major airports of Rifle are Meeker Airport (EEO), Glenwood Springs Municipal Airport (GWS) and Garfield County Regional Airport (RIL), which offer private charter services to business and leisure travelers from all parts of the world.